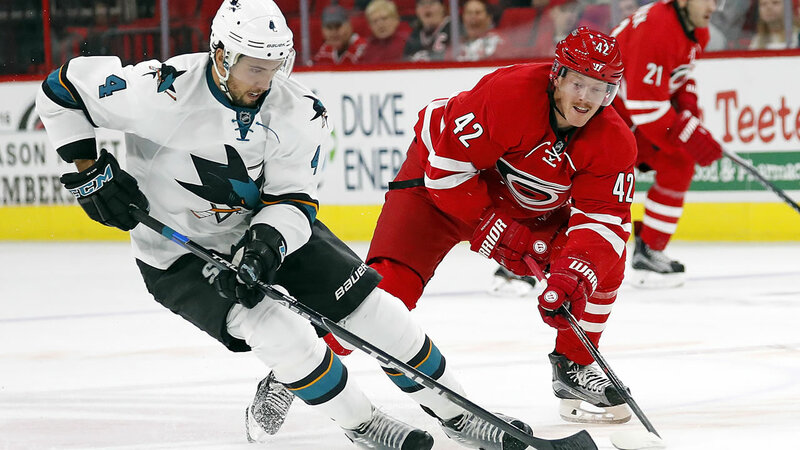 RALEIGH, N.C. -- Joakim Nordstrom scored with 9:12 left, Cam Ward made 22 saves in his first shutout in over a year and the Carolina Hurricanes beat the San Jose Sharks 1-0 on Tuesday night. Ward got the 24th shutout of his career and first since he blanked Colorado on Oct. 21, 2015, while improving to 6-1 in his career against the Sharks. That helped the Hurricanes win their second straight to escape last place in the Metropolitan Division, in the process snapping the defending Western Conference champions' three-game winning streak. Aaron Dell stopped 32 shots in his third career game and his second start for the Sharks, who managed just two shots on goal in the second period before coming on strong in the third. The sequence that led to Nordstrom's goal was started by Viktor Stalberg, who broke up a breakaway attempt with his stick. Ward then blocked Joonas Donskoi's tip-in try, and that eventually led to a rush the other way, with Nordstrom backhanding the rebound of his shot past Dell's glove for the fourth-line forward's first goal of the season. Before Nordstrom scored, the goalies had put on a show for the overwhelming majority of this one, with Dell and Ward matching each other save for save. Dell made a slick stop on a rising shot by Jeff Skinner early in the third, and a few minutes later Ward stopped a tricky tip from Logan Couture with about 13 1/2 minutes left.